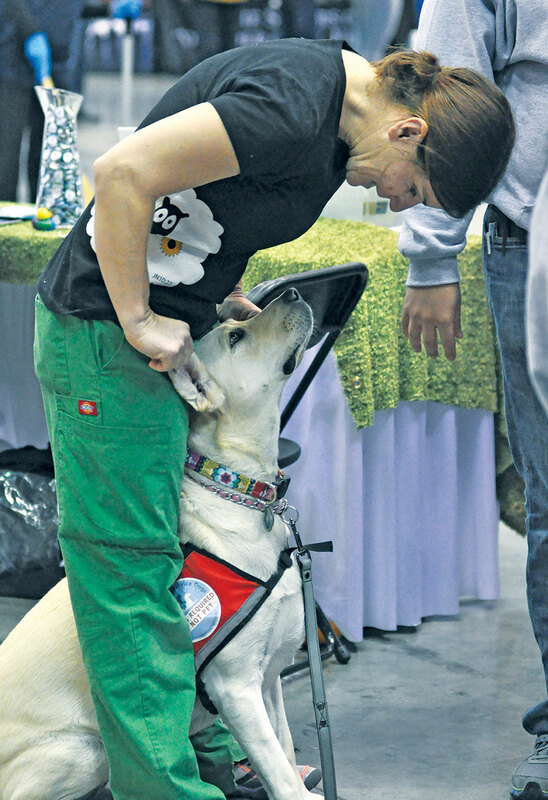 A common sight among the excited youths and silly hats at the biannual National Catholic Youth Conference (NCYC) is comedian Judy McDonald and her service dog Daisy. But they were not able to make it this year, and the reason is no laughing matter. On Sept. 29, McDonald was diagnosed with breast cancer. She underwent a double mastectomy on Oct. 27. The surgery was the latest in a list of issues that might make McDonald seem like a modern-day Job: an early trauma that led to ongoing post-traumatic stress syndrome (PTSD), a ruptured disc that resulted in back surgery three years ago, and a car accident that caused Daisy, her service dog for PTSD, to develop the disorder as well, which limits where McDonald can now travel. But the comedian, 41, is far from letting such setbacks get her down. “What doesn’t kill you gives you more material,” she quips. In fact, the very day she was diagnosed with breast cancer, she signed up with a group to train for a mini-marathon—only the second in her life—in her hometown of Vista, Calif.
“I thought my surgery would be scheduled before the mini, so I’d get to be like, ‘Darn, I can’t do it,’ ” she says with mock sincerity. McDonald is already talking about participating in another race in January “whether I run, walk or crawl. Just to have a goal is to have something to look forward to,” she says. Instead, she counts her blessings. Such positivity is a natural outgrowth of McDonald’s strong, lifelong Catholic faith. McDonald’s positive attitude was helped by the fact that her diagnosis came as no shock. With numerous relatives having cancer—including her mother and one of her sisters having breast cancer—her doctors have been monitoring her for years, even though she was told she didn’t have the gene that put her at greater risk for breast cancer. While the diagnosis was not a surprise to McDonald, it has still taken time to process. Battling breast cancer is not McDonald’s first lesson in faith—it took a lot of trust to switch from youth ministry to becoming a full-time comedian, performing for both youths and adults. “When I started as a professional comedian 20 some years ago, I told God, ‘As long as you keep getting me shows, I’ll keep going out,’ ” she says. McDonald jokes that her lack of future bookings has left her “feeling confident—confident that I don’t know how I’m going to pay my medical bills,” she says with a laugh. Being an itinerant minister, she only gets paid when she is performing. But, she adds on a more serious note, “I’m confident that somehow God will make the situation work. I’ve had an outpouring of support from my family, my friends” and her fellow itinerant ministers. One gig she can count on in the future is NCYC 2019 in Indianapolis. McDonald has some physical healing to do before getting back on the road. In a video posted on her Facebook page on Nov. 16, the first day of NCYC, she shared that she is still quite sore from the October procedure. Early next year, tests will be run to see if any cancer remains. If so, she’ll have chemotherapy; if not, then she’ll prepare for reconstructive surgery. But just because she isn’t performing doesn’t mean that McDonald isn’t ministering. When she’s ready to get back on the stage, McDonald says she’ll have a lot of new material. Meanwhile, she continues to count her blessings.